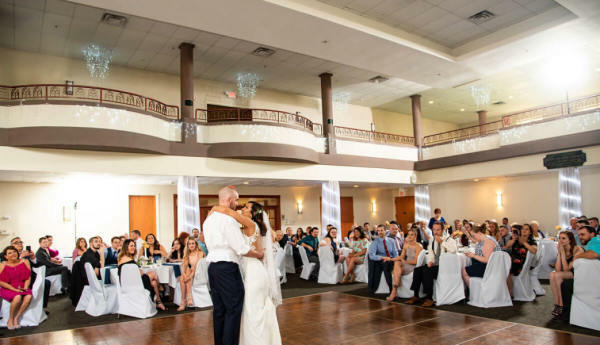 Come take a look at our facility for your wedding reception in Rochester NY for yourself and imagine your special day! The Grand Ballroom is ideal for parties up to 280 people. A complete service staff for the duration of the event, All food prepared fresh the day of the event, Mirrored centerpieces with candles, An Event Coordinator for the duration of the event, Choice of Tablecloths & Napkin colors, Balcony, Column & Stationary Table Lighting, Tables, Chairs, Wi-Fi, T.V, Multi-Media Equipment, and a buffet set up, which includes, all dishes, silverware, glassware. All rooms are equipped with a central speaker system! "We had an amazing experience with IACC!! Joanne listened to everything we wanted and made it happen! Highly recommend IACC for wedding and or reception!! The food was amazing and the staff was top notch!! Thank you IACC for making our day perfect!"